The relaunched site discusses new opportunities, including Outlook based support services. Automation Centre is pleased to announce the re-launch of their http://www.TrackerOffice.com website. This site, which debuted in 2001, showcases the products developed by Automation Centre that leverage the Microsoft Outlook email client in order to simplify, streamline and automate core business processes. How organizations can surface applications and tools inside their email for Outlook project management, including graphical reports and widgets. How to drag-and-drop emails in Microsoft Outlook into folders to automatically create tasks, project documents and even support tickets. How to synchronize tasks in Microsoft Outlook with tasks in Automation Centre products. How to establish an Outlook help desk system, providing a ticket creation and submission process, automating notifications of assignment and escalation, as well as surfacing ticket dashboards within the client. Establishing an Outlook time and billing system. 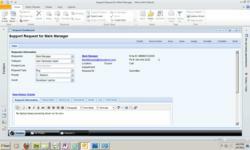 Leveraging Outlook to automate and secure the processes for time reporting, purchasing, expense reporting and invoicing. From the redesigned site, visitors may register to access a role based demonstration site, where they can evaluate the functions of Automation Centre products within a Web browser, from the perspective of multiple user roles, including a General User, a Manager, an Administrator and as an Executive. There are several demonstration sites available, showcasing how Automation Centre products might be used by a Project Management Office, a Professional Services firm, as well as an IT Management department. Demonstrations of the integration of Automation Centre products with Microsoft Outlook or other email platforms may be scheduled with an Automation Centre account representative. Automation Centre also offers another site, http://www.TrackerSuite.com, which demonstrates the capabilities of its products integrated with the Lotus Notes / Domino email system. Automation Centre products are available both as hosted services via the Web, as well as licensed, installed applications. In the case of licensing, source code is included with the license, allowing organizations with development resources the opportunity to customize the Automation Centre solutions for their particular needs. Automation Centre also provides services. The ability of Tracker products to leverage email systems has been a cornerstone of the Automation Centre development philosophy, since the company opened its doors in 1994. Harnessing the collaborative power of email to facilitate and streamline business processes, Automation Centre has provided solutions to both small businesses and international corporations, across a wide range of industries including Manufacturing, Financial Services, Insurance, Pharmaceuticals, Government and Professional Services. Automation Centre products have received industry awards, and the company has appeared in the Gartner Magic Quadrant on several occasions. Automation Centre's primary products include TrackerSuite.Net (for the Web), Tracker Suite (for IBM Lotus Notes / Domino) and TrackerOffice (for Microsoft Outlook/Exchange).